Years ago, circa 1986, I was working at a theater in Roanoke, Virginia. A friend had come to visit for a long weekend. It was Fall. Just around peak leaf-peeping time. My friend asked if we could take a day trip to some place called Appomattox Courthouse. “Sure!” I replied and quickly followed with, “What is an Appomattox Courthouse?” Thus began my education and fascination with the American Civil War. At that time I was under the impression that this was where the Civil War ended. As I discovered through more recent research, it’s actually the beginning of the end of a war that began April 12, 1861 at Fort Sumter South Carolina. By the time the battle reached Appomattox Courthouse in Virginia, it was April 9, 1865. Knowing these statistics helps me understand the weight on the minds of the Generals heading to Appomattox that first week of April in 1865. On April 1st, the Confederates were defeated at Five Forks and that prompted Lee to abandon the Petersburg Richmond siege lines. Lee then decided to move his army west in hopes of joining General Johnston in North Carolina. On April 6th Lee’s army received another blow when they were cornered along the banks of Sailor’s Creek, and many of his troops were annihilated. The major confederate losses prompted General U.S. Grant, on April 7th, to get a note through the lines to General Lee essentially telling him that the jig was up and it was time to bring out the white flag. Lee wouldn’t give. There was a bit more fight in him and he upped and moved his army to Appomattox. On April 8th there was another noted exchange between the generals. In this exchange Lee stated that he would not surrender his Army to an unknown fate, but he would be interested in hearing the terms that Grant would offer. On April 9th, Confederates under the command of John Gordon were able to drive back the Union by blocking the road near the village, but it did not change the fact that 125,000 Union solders were surrounding Lee’s Army which had now dwindled to 25,000 troops (give or take). Lee was cornered. The Generals met in a front sitting room. Lee donned his finest, including his shiny sword and polished boots. Grant came in off of the battlefield looking rather disheveled. Grant opened with “You may not remember me, but I remember you from the little war in Mexico.” I don’t think Lee really cared for the small talk. He was there as the loser. He was the one giving up and I’m going to guess he wanted it to be quick and merciful. After some more small talk they got to the nitty-gritty of the terms. What Lee may not have known is that Grant had had a little chat with President Lincoln at some point prior. It was pretty clear that the Confederates were done and they discussed how it might play out. Old Abe, in the gracefulness that was his character said, and I paraphrase, “When it comes time just let them get back to their farms and their shops.” What he was saying was no prisoners, no restraints, let them go home. That was what Grant offered under the terms of surrender. The terms weren’t very long. There wasn’t much to it. If you were an enlisted guy you had to lay down your arms. If you were an officer you could keep your side arm and your horse if you owned them prior to the war. You were not allowed to take up arms against the government, but you were allowed to go home. When I first went to Appomattox, it was a quiet Fall day. The chill in the air laid a cape over the quiet historic site. Walking around the grounds it felt like the soldiers were there, quietly watching over their comrades who had fallen. There was a point, in front of a fence and at the end of a road, where you could listen to a recording describing the events of those days. It was stunning and unforgettable. As the first of the confederates approached, a bugle was blown and the entire Union line came to attention. The Confederate General Gordon, at the head of his line, had been approaching with head bowed low. At the sound of “that machine like snap of arms” General Gordon “assumed the finest attitude of a soldier.” The two men, Gordon & Chamberlain, saluted as was fitting to do. 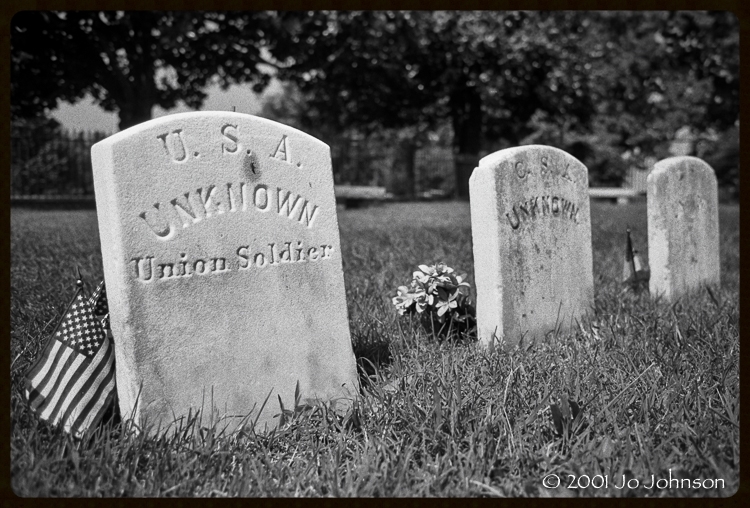 The Union line, understanding the occasion, stood quietly still. The only detectable movements were a few faces twitching with emotion. While to the Unions right, one by one, the Confederate Army that remained approached the union line, laid down their arms, and turned around for the long walk home. When I think about that day, and read the accounts, it makes me cry. Four years of bloody battle and they end it with a quiet salute. If there was respect at the end why couldn't it have been there at the beginning? Is it something that war does to a person? Is it the way of the times? While I look back at history and think that, yes, the union had to stay together and slavery absolutely needed to end. I also ask myself if war was the only road to peace.